Learn how to make an asynchronous call from the browser to the server, to validate some user input into a form, and then handle the response by alerting the user and programmatically submitting the form. Read more "Drupal 8 API: Ajax"
Learn how to create a custom form to receive input from a site visitor, and how to present that form on a particular URL, and then how to do something with the input to the form. Read more "Drupal 8 API: forms"
Read more "Drupal 8 API: menu entries, local tasks, and other links "
Learn how Drupal works out what code will handle a particular URL using routing, write some handling code, and configure the routing to call it. Read more "Drupal 8 API: routing API and page controllers"
Learn what regions and blocks are, and how to define a custom block in code and position it in a region. 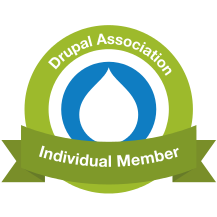 Read more "Drupal 8 API: blocks"
I'm a Drupal Association member! Want to learn about the Drupal 8 APIs, with worked examples? Follow my series of tutorials, covering routing, caching, entities, config and much more! for freelance work. But you can click here to contact me! A menagerie of testing: behavioural, unit, system, smoke, regression, oh my!